High quality chair covers available in White & Ivory round back or square. Not to be confused with thinner inferior quality material that fade quickly & show the colour of the chairs below! All Chair Covers are £2.99 each including sash, delivery, set up & collection. Put together to Save you Money! If you need extra chair covers or sashes then you can still save money! Just add the individually priced item to your chosen package! All our covers are delivered freshly laundered & pressed all on Hangers (not transported boxed). This means they smell fresh & are set up free of creases. Our bows are tied professionally by trained staff and will be precise and unrushed. If you're working on a tight budget why not do it yourself! With friends & family helping you can Save Hundreds of Pounds! Once shown it takes approximately 4 x People 2 x Hours to do 100 x Chairs! Usually you can do it the night before! "We'll even show you how to do the bows!" 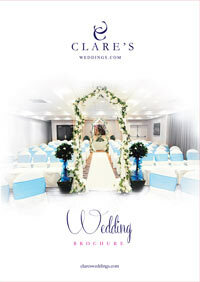 The Chair Covers Gallery links you to more beautiful images of Chair Covers & Venue Dressings! Before booking you you can use the contact form to make First Contact to see if we are available for your Wedding Date or to relay any question you may have. If we answer all your questions & requirements you can then download the below booking form and we will deal with the rest! Once you've decided to Hire from us please download the Booking Form above and send this back to us with your Deposit! Once we recieve this we send you a receipt and confirmation of your booking! The remainder of your balance is required 6 weeks before your Wedding Date or pay in installements allowing you to keep one eye on your budget! Same as full service but with Larger Square back covers for Larger Banqueting chairs! We deliver and collect your chair covers & they are then fitted by yourself or your friends & family! We deliver, Fit & Collect your chair covers & sashes! No other hidden costs!